When one is away from home, you start to crave certain foods. For me when I lived in Japan, I craved Cherry Ripes, chicken crinkle cut chips and Twisties. 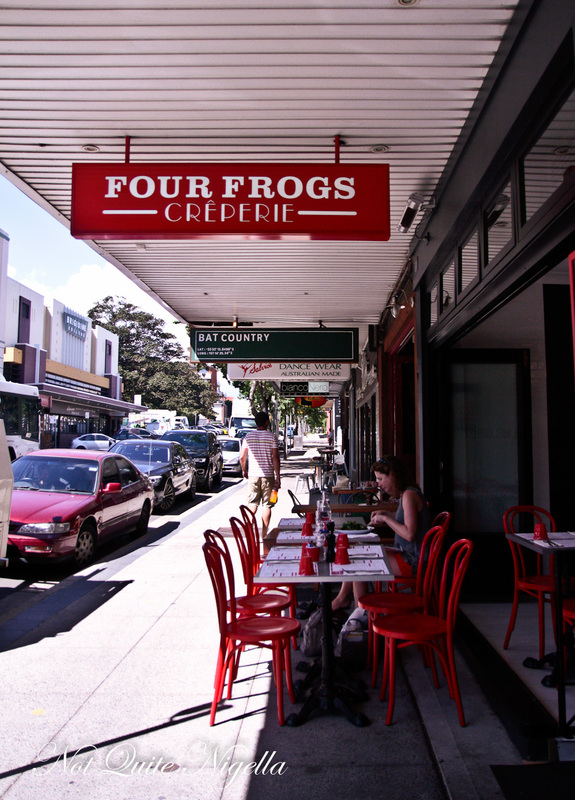 With the four owners or Four Frogs, the same happened to them but in their case, it was crepes and they decided to make a crepe cafe out of it. I only know this because their story is written on their chalkboard wall. 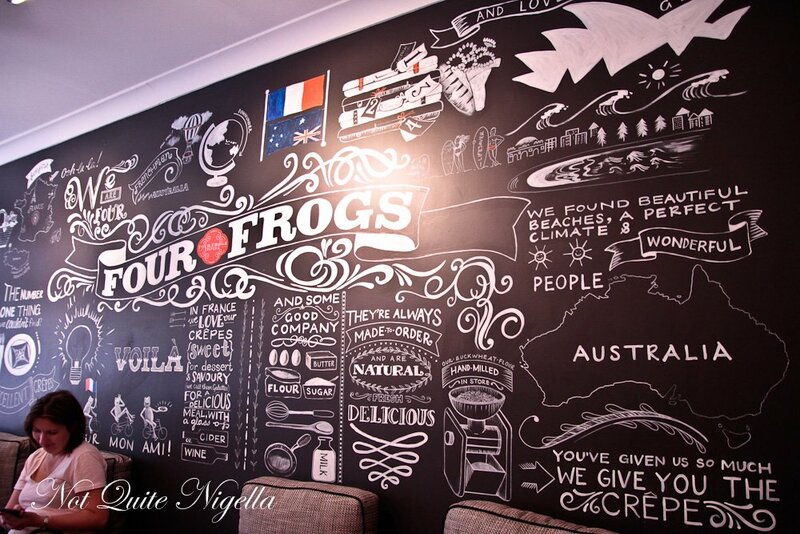 With one location already in Mosman, the Randwick branch of Four Frogs has been opened for a few months now. 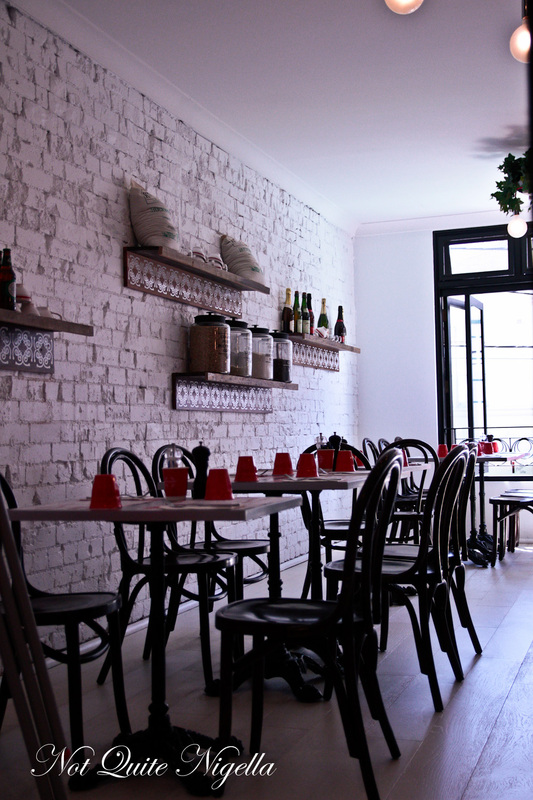 Located in a prime location opposite the Randwick Ritz cinema it's a place where cinema patrons drop in for something quick pre or post movie. I'm meeting Jaqi here for lunch and on this Thursday afternoon there are plenty of patrons including mums and babies and theatre goers. Crepes are most strongly associated with the Brittany or Breton region of France, an area rich with plenty of butters, salt and baked goods. Hundreds of years ago when wheat flour was scarce they used buckwheat flour to make crepes cooking them over hot stones to create galettes - these are savoury crepes made with the distinctive nutty flour. 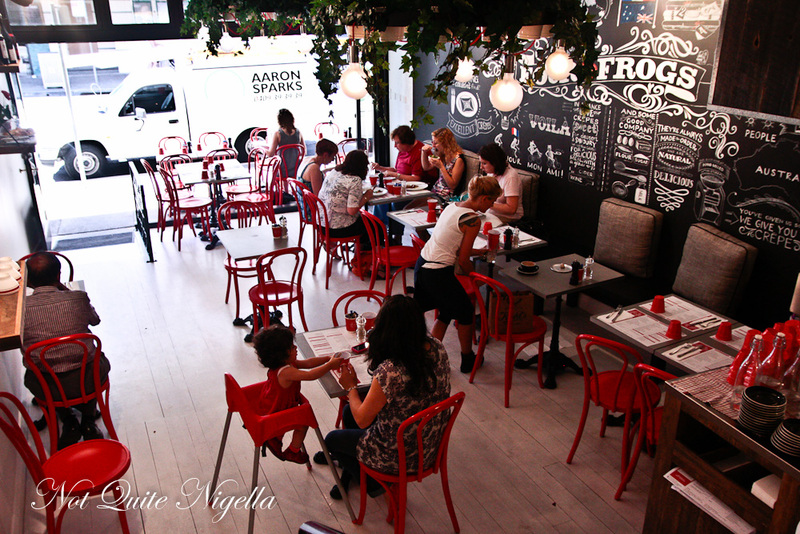 At Four Frogs, they mill their own buckwheat on the premises. Dessert crepes are made using white wheat flour. Jaqi and I are look through the menu with plenty of choice. We order one galette each while keeping a check on the dessert crepes and the challenge of selecting just two. Jaqi asks about the figs - she's a woman with similar tastes to me and it's a question that I want to know too. Our waitress assures her that they're good and she's right. 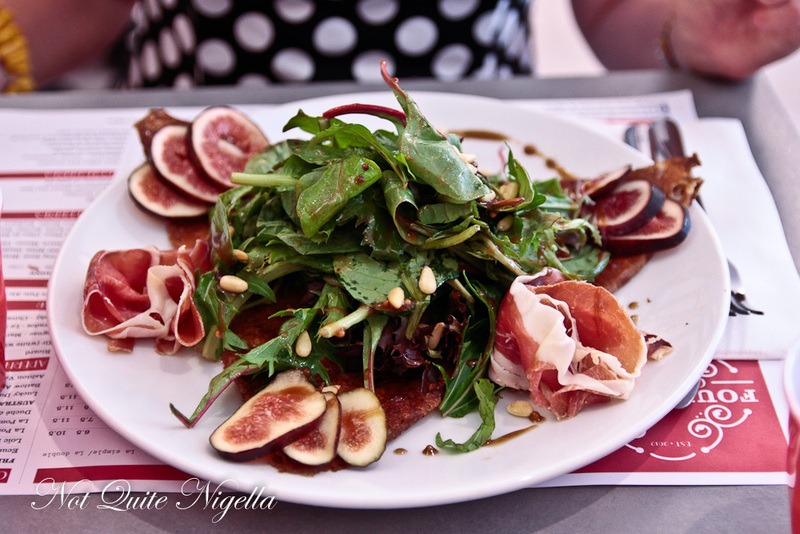 Sweet and luscious, the figs come sliced on a goat's cheese filled galette with pine nuts a swirl of paper thin prosciutto and a honey mustard dressing on the salad. 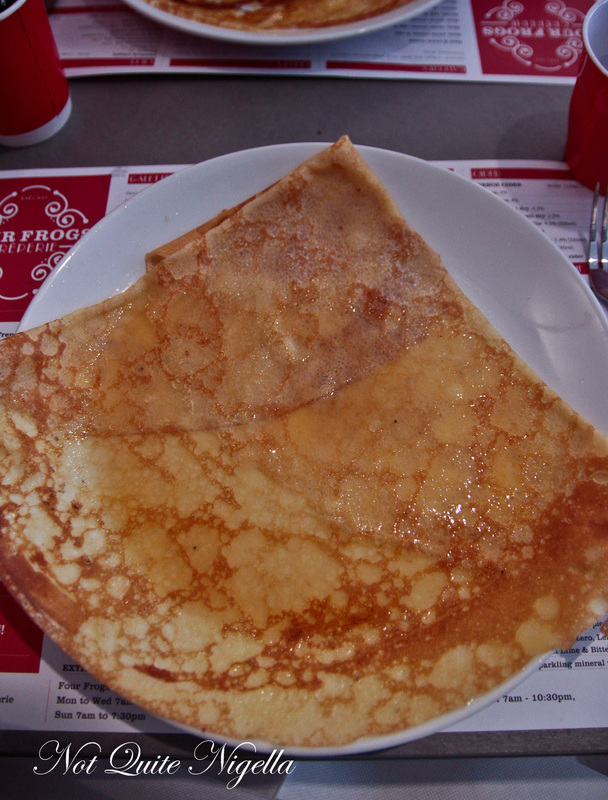 The galette is skilfully thin and reminds me of the galettes that I enjoyed in Vannes, Brittany. The filling of goat's cheese gives the galette a softness while the crispy edges are also delicious. Some toasting of the pine nuts would have been nice too. 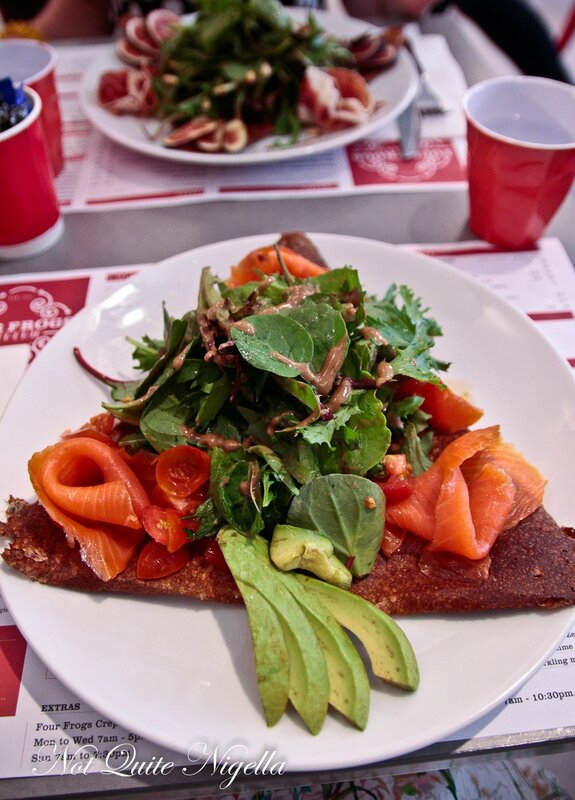 Whilst we both loved the fig galette the smoked salmon one tended more towards dry with just a little cream cheese inside the crepe and it was quite unevenly spread so that much of the galette was crispy and dry alongside the salmon, avocado and salad. Dessert crepes can be served as one or two crepes and these are thin white flour crepes. These are served flambéed on the way to the table. I find that a simple flavour like Grand Marnier really allows the crepe texture to show and they're blissfully tissue paper thin and light. But it's the crepe smothered in house made salted caramel sauce, slices of caramelised apple and a scoop of white chocolate flecked gelato that has us speaking in tongues. 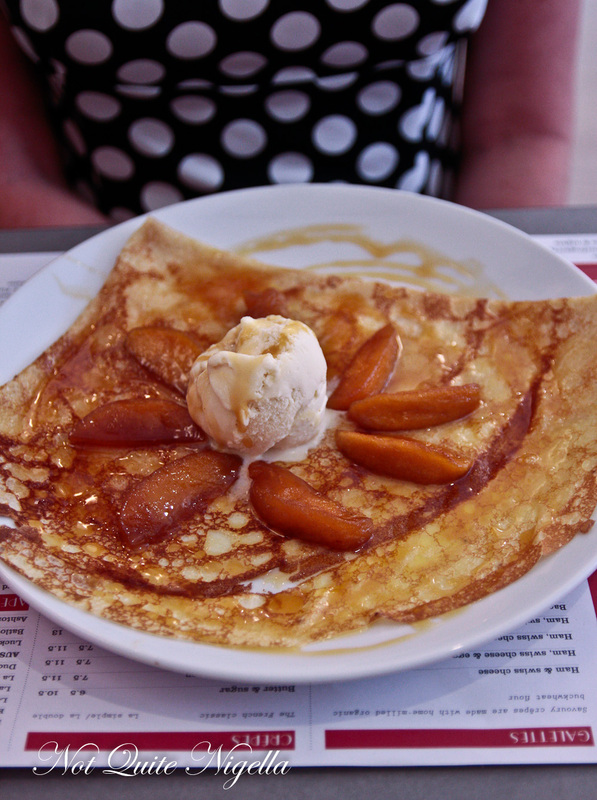 It's an indulgent but perfect balance of thin crepe, fruit, gelato and that other important food group: salted caramel. So tell me Dear Reader, what is the food that you would miss most from your country or city?